The Lost Within trailer for Campus Theatre from Creature Feature Design on Vimeo. The human mind can be a frail thing. Nobody really knows the exact cause of what one would consider abnormal behavior. Scientists have pointed to upbringing, genes, and pretty much everything else including the kitchen sink. Knowing the potential causes could point one in the right direction, but understanding the exact reasons of "why" we are who we are, will probably never be known. In this movie, David Gries plays a slightly unhappy reporter with dreams of becoming something more. A novelist. Gries, playing Jon in the film, mission is to scope out any socially awkward people who, for whatever reason, decided to shut themselves indoors and away from the world. Research for his book in progress. His first book at that. After numerous failed interview attempts with some really odd, introverted people, his contact directs him to the home of Agatha, played by Jami Tennille. Agatha is a long term resident of a small hotel and really, really doesn't like many people. As Jon slowly works his way into Agatha's life, he finds himself drawn to her. More than professional curiosity. Why is she like this? Who is she running from and why oh why did she decide to shut herself in? At this place no less? 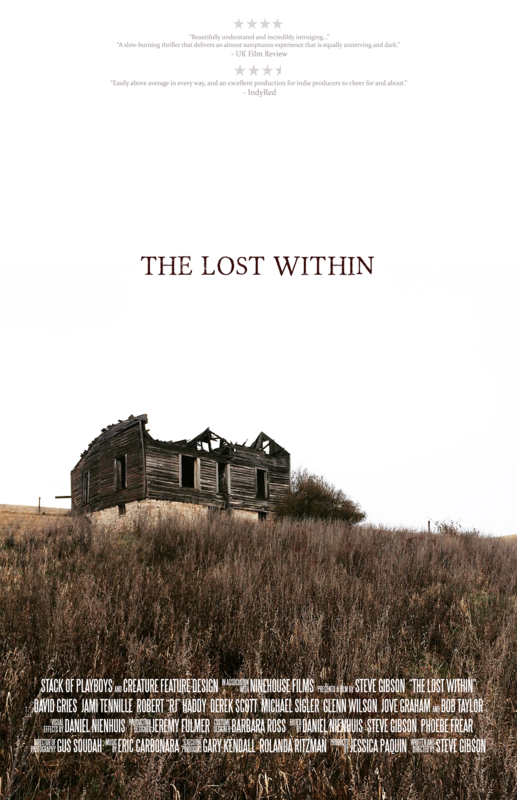 "The Lost Within" plunges forward with a calculated attempt to explain all this in an entertaining, believable way. Care to climb down down the rabbit hole? The visual look of this movie is really impressive for a non-studio backed film. There's never a sense of controlled sets or of hired actors. It's more of a feeling of a camera moving past real people in real places. One of the more convincing elements of the movie is the inclusion of potential sub-plots, hiding just beneath the surface for our supporting cast. We never really get to "know" any of them, but still sense the are close by. The excellent pacing of the scenes, including a nicely done dream sequence, are simply a pleasure to watch. I did notice a few strange transition choices scattered around the film but, aside from that, this really is a indie flick that flows nicely from start to finish. As far as indie and lower budget movies go, "The Lost Within" is a hands down winner. So what are you looking for in a thriller? Good characters and a good story? How about the ability to support the independent community without feeling like you're doing so? "The Lost Within" provides all this and a little extra. It's uncanny the way this film takes a strange overall situation, and makes it believable. This in no small part is probably due to the excellent dialog and the superb actors playing the parts. Steve Gibson, who wrote and directed this film has a definite knack for this stuff. A more sober yet chilling look inside a slightly jarred mind, and the roads some of us will take to understand why. "The Lost Within" never had me feeling lost. When it was over, everything was understood and the film accomplished it's one true goal. To be entertaining. I was glad to be a passenger on this indie train, and humbly submit my personal review.